The fourth tropical cyclone of the Eastern Pacific season formed on Saturday, June 23. 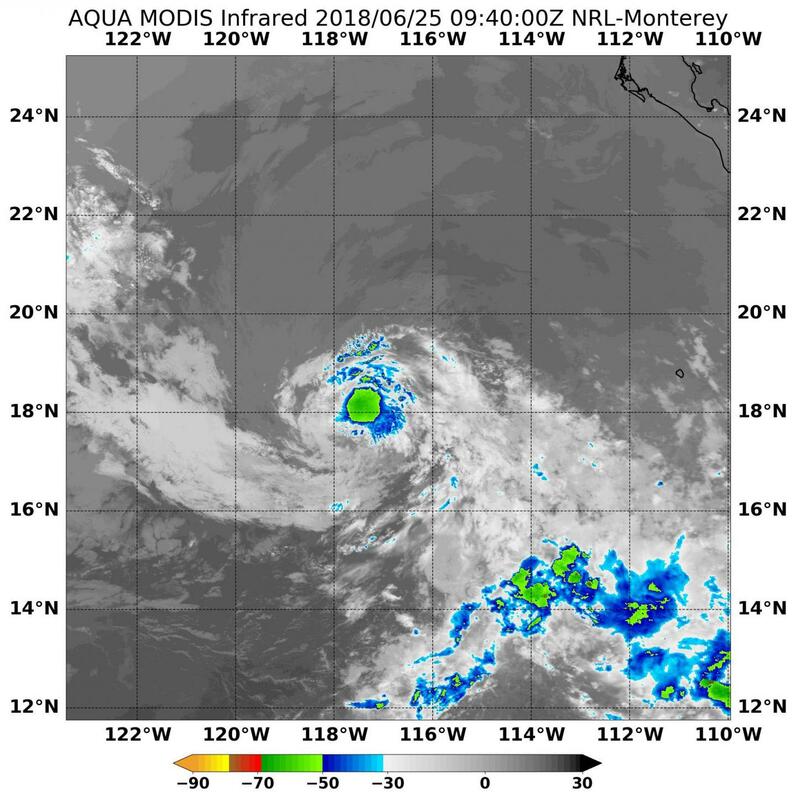 It strengthened into a tropical storm, and on June 25, 2018, NASA's Aqua satellite passed overhead and analyze the storm in infrared light which provides valuable temperature data. On June 25 at 5:50 a.m. EDT (0950 UTC), infrared data from the moderate resolution imaging spectroradiometer or MODIS instrument showed a very small area of strong thunderstorms around tropical storm Daniels center of circulation. Those thunderstorms had contact temperatures near minus 63 degrees Fahrenheit or minus 53 degrees Celsius. NASA research has shown that cloud tops that cold can produce heavy rainfall. There are no coastal watches or warnings in effect. Daniel is far from land at 575 miles west-southwest of the southernmost tip of Baja California, Mexico. At 11 a.m. (1500 UTC), the National Hurricane Center said the center of Tropical Storm Daniel was located near latitude 19.0 North, longitude 117.8 West. Daniel is moving toward the northwest near 9 mph (15 kph). A turn toward the west-northwest is expected by tonight, followed by a westward motion on Tuesday and Wednesday. Maximum sustained winds have decreased to near 40 mph (65 km/h) with higher gusts. Additional weakening is forecast, and Daniel is expected to weaken to a depression later today or tonight. The cyclone is then forecast to degenerate to a remnant low pressure area Tuesday or Tuesday night.